July 23, 1972 B&O 6476, Stranded in Georgetown after Hurricane Agnes damaged the Branch. I purchased this original slide off of eBay a few weeks ago. Here’s the story behind the image. On June 19-22, 1972 Hurricane Agnes made its way across the Southeast USA and on up the coast to the Mid Atlantic, wreaking havoc along its way. DC saw its share of major flooding, with the Georgetown Waterfront being particularly badly hit. At the time, traffic on the Georgetown Branch had dwindled to a train every few days or once a week, depending on conditions. The rumor was that the B&O was looking for a way to get rid of it and had it not been for this locomotive, the branch may have been abandoned right then and there. Why, you say? About five years prior, arsonists had set fire to the beautiful long wooden trestle crossing the creek. The spectacular blaze damaged the trestle, but they were able to salvage it. 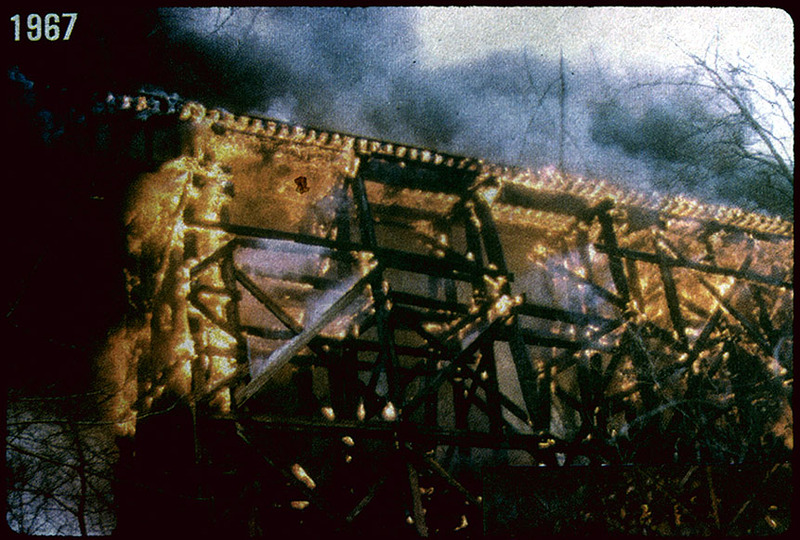 1967 – Arsonists set fire to the Rock Creek trestle. G. Fred Stork photo, collection of the late Wm. Duvall. When Agnes came through, it wrought havoc with incredibly heavy rains and destructive winds. The Georgetown Branch did not just suffer in Georgetown along the waterfront, but probably most significantly in its crossing of Rock Creek. The already-weakened trestle was devastated by flooding at Rock Creek and collapsed into the creek below. The B&O had to figure out what to do: rebuild, or just call it a loss and seek abandonment. But there was one big problem. Engine 6476, now isolated in Georgetown along the waterfront. The engine was too valuable to scrap and too heavy to haul out, so the railroad opted to rebuild. This time, the bridge was repaired with steel. New bents were laid in and the whole structure was shored up. 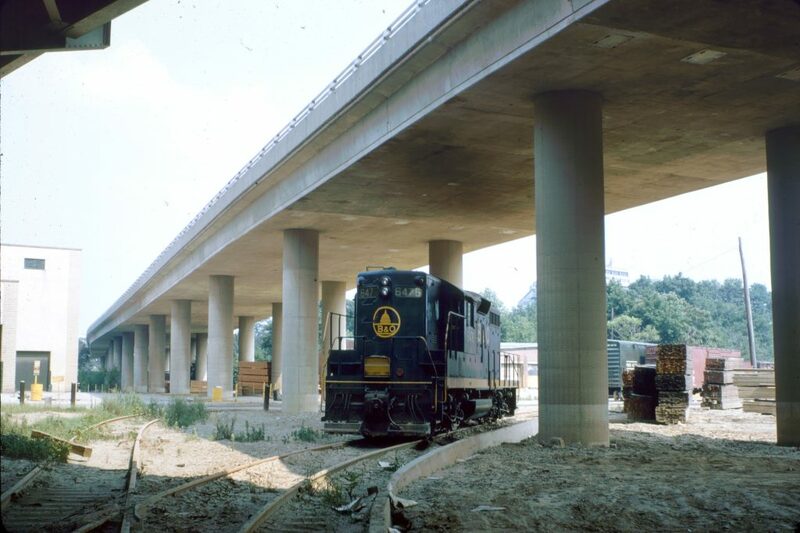 1972 the B&O trestle across Rock Creek is rebuilt following destruction from Hurricane Agnes. Note the charring from the arsonists damage five years prior. The branch is still in use today, as part of the Crescent Trail, having been cleaned up a bit and had a second deck laid on top of the rails so cyclists and pedestrians can enjoy the beautiful views of the creek valley. (Yep, the rails are still there! 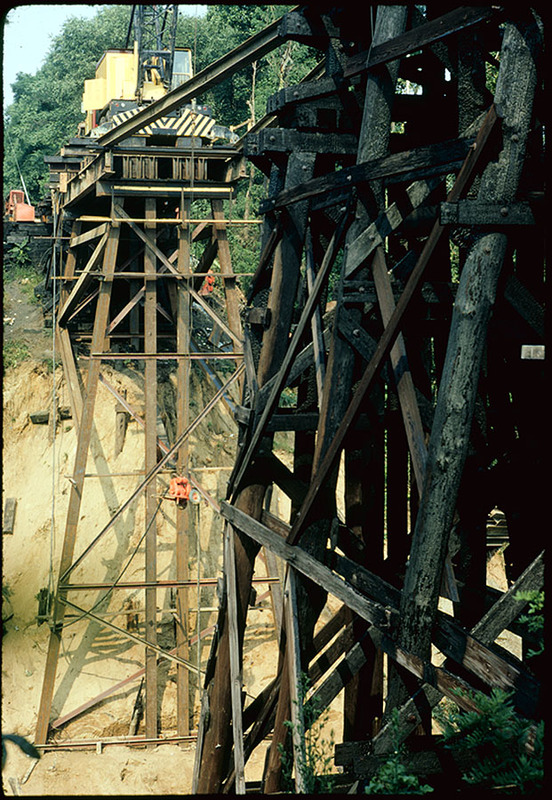 Next time you’re there, peek under the walkway and you’ll see the original rails and wood decking) So next time you are in Georgetown or strolling across the Rock Creek trestle, remember the story of the loco that saved the railroad. The Georgetown Branch would live on in service for another 13 years, until 1985. Do you know what bridge is 6476 hiding under in that photo? Whitehurst Freeway uses steel supports, and Key Bridge is arched the whole way. Closest I could find in that area is exit ramps from Whitehurst across Rock Creek to I-66, but those are supported by single columns. Wow they were willing to go through all that effort and cost just to save one loco? Was B&O’s engine roster really so depleted at that time? My thought is it also had to do with remaining contracts the B&O valued, specifically to deliver coal to the heating plant. Judging by the unconventional repair to the Rock Creek trestle, my guess is that they did “just enough” to get the line back in service for a few more years, rather than rebuilding the trestle with something more robust.